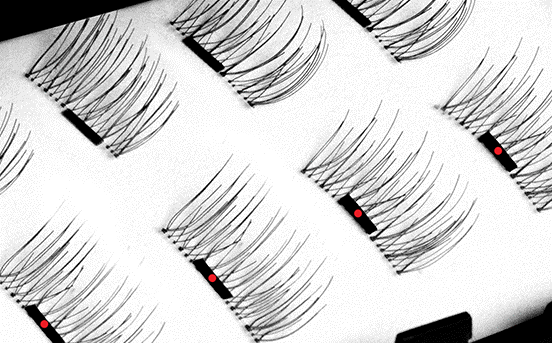 Magnetic eyelash extensions are the latest technology in the lash industry. The main advantage of these lashes is the fact that in addition to the glue used in sticking the lash extensions to the natural lashes, the magnetic force will help in holding them together and the possibility of falling off will be minimal. To apply magnetic eyelash extensions, you will not need to use lash glue, the tiny magnets in the lash extensions will lock the lash extensions together. The natural lashes will be sandwiched in between the magnetic lashes making them have a firm hold. Magnetic lashes should be trimmed to the size that will fit on the natural lash line. One layer will be placed on the upper side of the natural lashes while the other layer will be placed under the natural lashes. One Two Cosmetics: The lashes are packed in full strips so that they can perfectly fit in the exterior corners. They also have an applicator that is similar to tweezers which will be used in the application though one can also use fingers to apply the lashes. The lashes are made of synthetic material and are more expensive than the other types of magnetic eyelash extensions. Ardell’s Strip Eyelashes: They have four magnets which makes them hold more firmly than One Two Cosmetics that only have three magnets. Before you apply magnetic eyelash extensions, you should conduct attest patch so that you will rule out any allergic reactions. Make sure that the aesthetician who is applying the lashes is well versed on the proper way of applying them so that you will not end up with a look that is worse than you were before the applications. You can ask for a photo of a previous application which will tell you if he knows the proper method of application or not. If he has never applied magnetic lashes, look for another esthetician to avoid putting your eyes and natural lashes at risk.